CEO Tim Cook announced the milestone on Tuesday. Apple Music’s numbers continue to inch up. The streaming service now has 50 million users through a mix of paid subscriptions and free trials, CEO Tim Cook announced Tuesday during an interview with Bloomberg Television. That’s an uptick of 10 million subscribers since April, when Apple Music passed 40 million subscribers. Cook did not detail how many of the 50 million users are free trials. Apple is currently readying a large content push through its newly created original programming division, led by Sony TV veterans Zack Van Amburg and Jamie Erlicht. The company has yet to provide details about how its forthcoming shows, including a reboot of Steven Spielberg’s Amazing Stories and a morning show drama from Jennifer Aniston and Reese Witherspoon, will be distributed. If you want to transfer the downloaded Apple Music songs from your computer to the Huawei P20 or P20 pro via a USB cable, you may find that you can transfer only some audio files in iTunes Media Folder, but you can’t transfer the downloaded Apple Music files or even you can transfer them, you can’t play them normally. As a streaming Music service, all the Apple Music files are DRM protected. With the subscription, you can play, enjoy and download these music tracks with the Apple account, but you can’t transfer them to other non-Apple Music player and devices. So what can we do to remove the DRM and then transfer the downloaded Apple Music playlist to Huawei P20 or P20 Pro, the following guide will help you deal with problem. 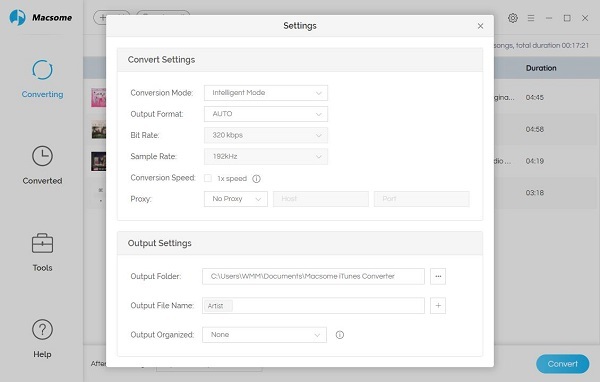 To deal with the problem well, you need to free download Macsome iTunes Converter at first. 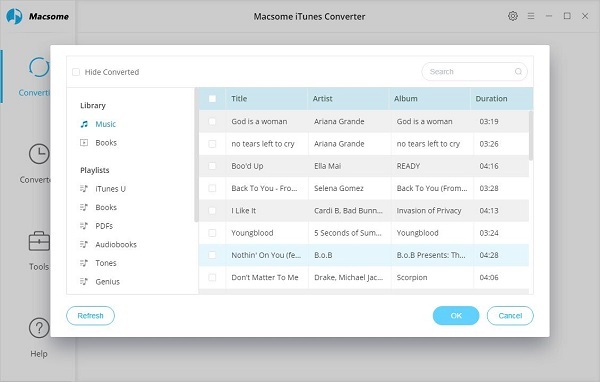 Macsome iTunes Converter is an ideal solution to remove DRM from protected iTunes audio files including Apple Music files, purchased Audiobooks and so on. After the conversion, the converted audio files can easily be played on Sony PSP, Sony Walkman, iRiver, Android Phones and Tables and so on. Step 1, Double click to install the trial version of iTunes Music Converter on your PC, and then run it. Step 2, click the Add button and select audio files from iTunes library. 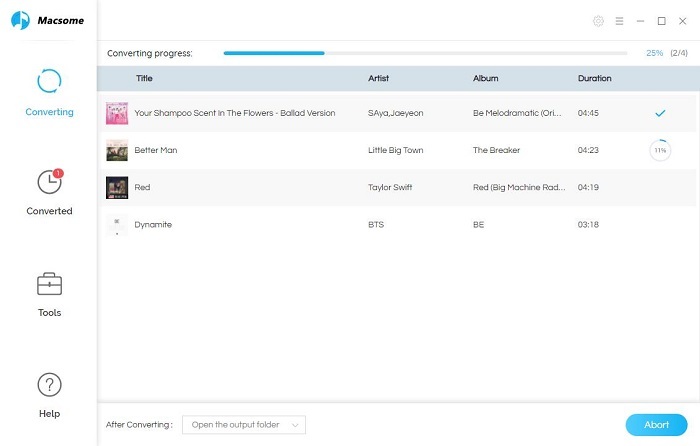 After you choose the music files, click “OK”, and then all the audio tracks files you selected would be listed on the main window. After the conversion, you get the unprotected MP3 music files from protected Apple Music files. Now connect Huawei P20 or P20 Pro to PC via a USB cable and open the output Folder to choose the converted Audio files and then copy them to your phone. Apple unveiled its charts ranking the most popular movies, TV shows, music, apps, books and podcasts in the U.S. for 2017 — with both new and familiar faces in the world of media and entertainment. On Apple Music, Drake had the No. 1 album of the year with “More Life,” while Ed Sheeran’s “Shape of You” scored the most-downloaded song. Taylor Swift’s “Reputation” has already rocketed to No. 3 on the 2017 top album ranking since its Nov. 10 release. Apple also announced the App Store editors’ picks of their favorite apps of 2017. Calm, which provides guided meditations and mindfulness exercises, was named iPhone app of the year and Splitter Critters won iPhone game honors. For iPad, Affinity Photo was named app of the year and The Witness was dubbed best game. 2016 is over，now this is 2017, happy new year. Every new start, we like to summarize the last year, here I would show you the Top 5 songs of iTunes 2016. Maybe your favorite song is in it. “One Dance” is a song by Canadian Toronto-based hip hop recording artist Drake from his fourth studio album, Views (2016). It features guest vocals from Nigerian Afrobeat artist Wizkid and British singer Kyla. The artists co-wrote the dancehall and afrobeat song with its co-producers Nineteen85, DJ Maphorisa, and Noah “40” Shebib, with production assistance from Wizkid. Crazy Cousinz and Kyla also received songwriting credits for the sampling of their 2008 UK funky song “Do You Mind?”. “Can’t Stop the Feeling!” is a song recorded by American singer and songwriter Justin Timberlake for the soundtrack to the film Trolls, for which he serves as the executive music producer. It was written and produced by Timberlake, Max Martin and Shellback. Musically, it is an uptempo disco-pop, soul-pop number with funk influences. The song was released as a single on May 6, 2016, and serviced to contemporary hit radio on May 10, 2016. Timberlake gave his first televised performance of “Can’t Stop the Feeling!” during the interval act of the Eurovision Song Contest 2016 grand final. Directed by Mark Romanek, its music video was released on May 16, 2016, and follows Timberlake on a tour to everyday places as he dances through what a typical day might be—it was followed by a number of fan-made videos. “Work” is a song recorded by Barbadian singer Rihanna for her eighth studio album, Anti (2016), featuring Canadian rapper Drake, the song was released as the lead single from Anti on January 27, 2016 through Westbury Road and Roc Nation. The song was written by PartyNextDoor, Drake, Rihanna, Monte Moir, Rupert “Sevn” Thomas, Allen Ritter and Matthew Samuels, and was produced by Boi-1da, Sevn Thomas, Ritter, Kuk Harrell and Noah “40” Shebib. The dancehall, reggae-pop and R&B song, contains an interpolation of “If You Were Here Tonight” (1985) performed by Alexander O’Neal. Lyrically, the song incorporates themes of working for money, as well as discussing fragile relationships. The song uses West Indian Patois and Creole. “My House” is a song by American recording artist Flo Rida from his 2015 EP of the same name. The song was released as the album’s third official single on October 13, 2015 in the United States. The song contains samples from “Impeach the President” by The Honey Drippers. “My House” was chosen as the theme song for WWE’s WrestleMania 32 with Hello Friday, also by Flo Rida. The song was also used in ESPN montages for Opening Day 2016 on April 3, 2016 as the first games of the MLB season were being played. “7 Years” is a song by Danish soul-pop band Lukas Graham from their second studio album, Lukas Graham. The song was released as a digital download on 18 September 2015 by Copenhagen Records. The lyric video was uploaded to YouTube on 17 November 2015, and the music video was uploaded on 15 December 2015. It topped the charts in Denmark, Sweden, Austria, Australia, New Zealand, Ireland, the UK, and Canada, while reaching the top ten in other European countries, as well as the United States. The song was written by Lukas Forchammer, Stefan Forrest, Morten Ristorp, and Morten “Pilo” Pilegaard. The song was produced by Stefan Forrest and Morten Ristorp under their stage name Future Animals, and Pilegaard. The song was mixed by Delbert Bowers and Morten Pilegaard. “Closer” is a song by American DJ duo The Chainsmokers, featuring American singer Halsey. Andrew Taggart (one half of The Chainsmokers) also provides his vocals in the song. It was released on July 29, 2016, by Disruptor Records and Columbia Records. The song was written by Andrew Taggart, Ashley Frangipane, Shaun Frank, Frederic Kennett, Isaac Slade and Joe King, while the production was handled by The Chainsmokers. Musically it is an EDM and dance-pop song with a “retro” style synthesizer in the chorus. “Love Yourself” is a song recorded by Canadian singer Justin Bieber for his fourth studio album Purpose (2015). The song was released first as a promotional single on November 9, 2015, and later was released as the album’s third single. It was written by Ed Sheeran, Benny Blanco and Bieber, and produced by Blanco. An acoustic pop song, “Love Yourself” features an electric guitar and a brief flurry of trumpets as its main instrumentation. During the song, Bieber uses a husky tone in the lower registers. Lyrically, the song is a kiss-off to a narcissistic ex-lover who did the protagonist wrong. “Don’t Let Me Down” is a song by American production duo The Chainsmokers. The song features the vocals of American singer Daya, and was released on February 5, 2016, by Disruptor Records and Columbia Records. The song was written by Andrew Taggart, Emily Warren and Scott Harris. Musically, it is a dance-pop song with trap influences. “Stressed Out” is a song written and recorded by American musical duo Twenty One Pilots, for their fourth studio album, Blurryface (2015). Written by Tyler Joseph and produced by Mike Elizondo, the lyrics discuss the harsh end of adolescence and the transition to adulthood. The song was released as a promotional single on April 28, 2015 on the Google Play Store and Amazon, and was issued to top 40 radio stations as the albums third official single on November 10. “Panda” is the debut single by American rapper Desiigner. The song premiered on December 15, 2015, and was released for digital download on the iTunes Store as a single, before being re-released on February 22, 2016. The song was written by Desiigner and his producer Menace. “Panda” was heavily sampled by Desiigner’s fellow GOOD Music label-mate and founder Kanye West, for “Pt. 2”, a song on West’s seventh studio album The Life of Pablo, and inspired a number of remixes. The single topped the US Billboard Hot 100 at the end of April 2016. A music video was released on May 10, 2016. It was nominated for best hip hop video at the 2016 MTV Video Music Awards. Apple and Microsoft have both announced new computers this week built for professionals, and while the companies’ hardware may be very different, the way they’re selling these new devices is eerily similar. Check out the MacBook Pro overview from Apple above, then watch Microsoft’s introduction for the Surface Studio. Okay, so one has a Jony Ive voiceover and the other has a dramatic cover of “Pure Imagination,” but the general arc of the videos — the narrative they’re trying to tell the consumer — is the same. We start with the camera lingering on polished, machined surfaces; gleaming chrome and impregnable aluminum. The inner components break apart as if in zero gravity, giving us a chance to see how each individual part fits together, and then the whole thing reassembles like a slow-mo explosion in reverse. A human enters the frame, touching the computer and bringing it to life. For Microsoft that means adjusting the Studio’s display, for Apple it’s activating the Touch Bar, but the meaning is shared — we put all this together. Even the test footage used to show off the screens is the same: explosions of colorful powder surely inspired by photographs of the Hindu festival of Holi. Of course, none of this cinematography is uncommon (what’s rare is Apple and Microsoft announcing new computers back to back). Tech companies of all stripes have been using the slow-mo-component-explosion shot for years as way to show off the engineering that’s gone into making these devices. What’s perhaps most interesting is the reactions to the two videos. The Apple one seems unremarkable, but Microsoft’s is genuinely exciting. The question is: why? It could be a result of over-familiarity with Jony Ive videos, which follow a familiar cadence but are so unchanging they almost slip into self-parody. It could be that Microsoft’s video is just better — the music pushes all sorts of emotional buttons, and we get to see the Studio and its peripherals just do more. But there might also be a larger issue with brand. Both companies seem like they’re repositioning themselves; with Microsoft pushing into the professional creative market, and Apple moving the MBP more mainstream (e.g. emoji on the Touch Bar). The former move is, to me at least, more exciting. Apple Music allows users to sync and match the paid music songs of iTunes, but it has clashes with iTunes Match. Finally Apple Inc. seems to fix this problem. According to the Loop news, iTunes Match can match and sync with iCloud Music and paid music with voiceprint pairing. This seems better that Apple Music sync with the old version of iTunes Match by metadata to pairing. After the new version’s update, Apple Music can match the music data correctly, and won’t match the concert version with the studio version by mistake. This is very great. In other words, in the new version, if you are an Apple Music users, you can also get the iTunes Match service. 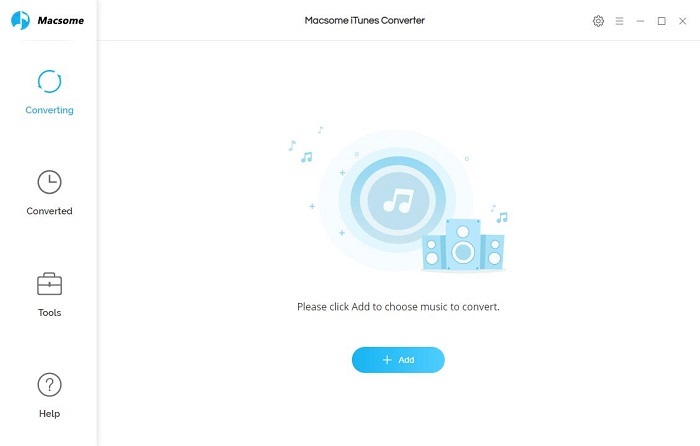 If you find, iCloud state of iTunes has set in “paired (Matched)” word, as evidenced by the new functionality has been added to your Apple Music, no, then it may be because the data is still being paired it. Read related more: Apple Music to MP3 Converter, Remove Apple Music DRM, iTunes Match VS Apple Music. The new iTunes version lands today alongside OS X El Capital 10.11.6, iOS 9.3.3, tvOS 9.2.2 for Apple TV, and watchOS 2.2.2 for Apple Watch. Apple also released new betas today for developers with iOS 10 beta 3 alongside tvOS 10 beta 3 for Apple TV and watchOS 3 beta 3.
iTunes version 12.4.2 is available to install via the Mac App Store with the OS X El Capitan 10.11.6 update that brings various improvements for stability, compatibility, and security.